Drought monitor for 9 August 2011. Credit: Laura Edwards, Western Regional Climate Center, NOAA. This week’s US Drought Monitor reports the sudden emergence of drought in the Corn Belt states of South Dakota, Iowa, Illinois, and Indiana. Extreme heat combined with below average rainfall have stressed corn plants—often in areas where planting was already behind schedule due to an extremely wet spring. From flash flood to flash drought. Stream flow conditions on 11 August 2011. Another way of looking at this is through stream flow. 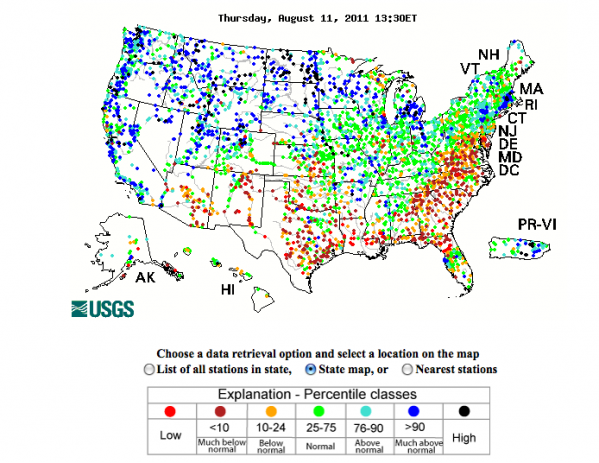 The above image is for today 11 August 2011 and is computed from stream gauges with at least 30 years of data history behind them. As you can see, the Corn Belt waterways are dwindling. This is unprecedented territory, as the precipitation deficits mount, and triple digit temperatures continue to increase water demand. Significant, ongoing impacts related to agriculture, water supply, and natural vegetation conditions have been reported. Crop moisture index for week ending 6 August 2011. Credit: NOAA. Another way of looking at that is through the crop moisture index. The image above shows a compilation for the week ending 6 August. 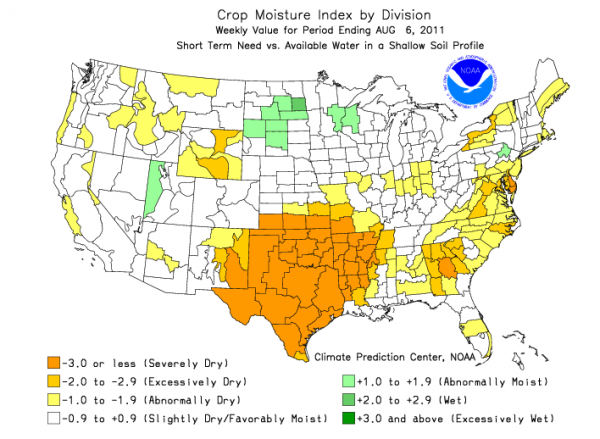 Abnormally, excessively, and severely dry conditions now beset most of the South. The Corn Belt and the Eastern Seaboard are playing dessication catch-up. 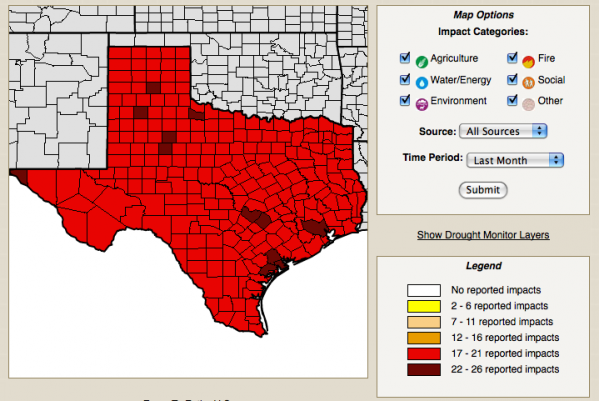 Texas drought impacts by county, for the past month. Credit: National Drought Mitigation Center. In Texas, every county is reporting extreme drought impacts—to crops, water supplies, the environment, even social impacts, like fishing and other forms of recreation. The Boston Globe reports that wildlife in Texas is suffering too, with deer nibbling “junk food” plants and wild turkeys scrabbling after ants. As reservoirs empty and some of the state’s bodies of water are at their lowest points ever recorded, fish are dying in droves. Sadly, the long term forecast is not good. 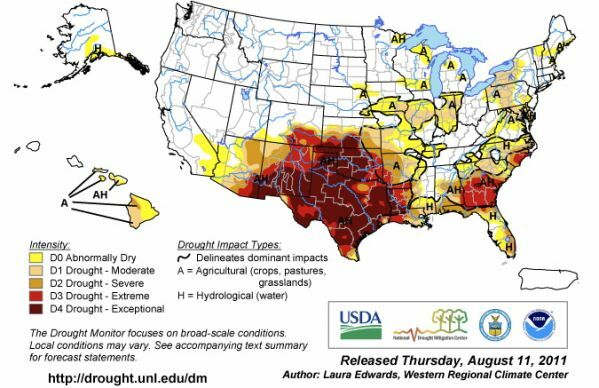 The Climate Prediction Center predicts the drought to last through at least the end of October, while some parts of the South need more than 20 inches of rain in a month to end it. Sea surface temperature anomalies for 27 July 2011. Credit: NOAA Climate Prediction center. Meanwhile the La Niña conditions fueling the drought—and all the other weird weather of the last 12 months—are looking oddly durable. While the current La Niña is winding down, some models now suggest that another may wind back up again in the autumn… a rare double Niña. That’s because while ocean temperatures are trending away from another La Niña (above), atmospheric conditions are not letting go (below). Atmospheric convection anomalies 2-27 July 2011. Credit: NOAA Climate Prediction Center. During July 2011, ENSO-neutral was reflected in the overall pattern of small sea surface temperature (SST) anomalies across the equatorial Pacific Ocean [above: SST anomalies]. All of the latest weekly Niño index values were generally near average, ranging from –0.2oC to 0.5o. However, the subsurface oceanic heat content anomaly (average temperature anomalies in the upper 300m of the ocean) continued to weaken and is currently near zero, which reflects the strengthening of the below-average temperatures at depth in the east-central Pacific Ocean. The atmospheric circulation anomalies were more variable during the past month, but the monthly means still reflect aspects of La Niña. For example, convection continued to be enhanced over eastern Indonesia and Papua New Guinea, and generally suppressed over the central equatorial Pacific, mainly south of the equator [above: OLR anomalies]. Also, anomalous low-level easterly and upper-level westerly winds persisted over the central tropical Pacific. Thus, while tropical Pacific oceanic anomalies indicate ENSO-neutral, the atmospheric patterns continue to reflect La Niña-like conditions.